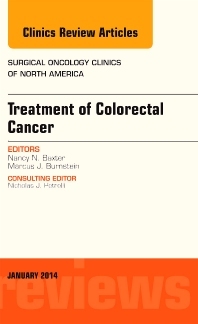 This issue of Surgical Oncology Clinics of North America is devoted to the treatment of Colorectal Cancer. Editors Nancy Baxter, MD and Marcus Burnstein, MD have assembled some of the top experts in the field to review this important topic. Articles in this issue include: Colonoscopy: What are we missing? ; Imaging in rectal cancer: MRI vs. ERUS; Local Excision for Rectal Cancer; Controversies in Neo-adjuvant treatment for rectal cancer; Management of the complete response; Controversies in laparoscopy for CRC; Colon resection – is standard technique adequate? ; Quality Assurance in CRC surgery; Controversies in Abdomino-perineal resection; Functional Consequences of CRC management; Timing of adjuvant therapy for CRC; and Management of Stage IV disease. This issue of Surgical Oncology Clinics of North America is devoted to the treatment of Colorectal Cancer. Editors Nancy Baxter, MD and Marcus Burnstein, MD have assembled some of the top experts in the field to review this important topic.Articles in this issue include: Colonoscopy: What are we missing? ; Imaging in rectal cancer: MRI vs. ERUS; Local Excision for Rectal Cancer; Controversies in Neo-adjuvant treatment for rectal cancer; Management of the complete response; Controversies in laparoscopy for CRC; Colon resection – is standard technique adequate? ; Quality Assurance in CRC surgery; Controversies in Abdomino-perineal resection; Functional Consequences of CRC management; Timing of adjuvant therapy for CRC; and Management of Stage IV disease.